Good afternoon/evening, BB addicts!! The houseguests were lazy lumps today and napped until almost 3:30pm BBT (except Elissa, who was up & on the hammock most of the time). Nothing that excitiing is going on today. Amanda knows she's getting evicted Thursday and so it looks like it might be another boring few more days until Thursday's double eviction episode. 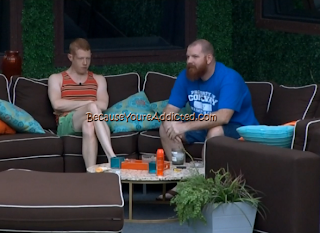 Speaking of Thursday, Andy/Spencer had a convo at 3:49pm BBT on Cam 1 that is very noteworthy. It seems that Elissa is their next target this upcoming double eviction. Andy: "If I win HOH, I'm gonna put up Judd/Elissa, because that ensures that Elissa would go home or we could backdoor McCrae. I have to nominate Judd because if I don't, he could win (veto) and use it on Elissa. Or win it, and not use it. I was trying to cover all my bases and I think that would be my safest bet." Spencer: "Yea I agree...and then GM as the replacement nom (to ensure Elissa would go with votes from Spencer/McCrae to get Elissa out). Then it'd be the Exterminators VS McCrae." Spencer: "Which is also our 3 way boys alliance." Andy: "Would you do the same thing (Elissa/Judd, GM replacement nom)?" 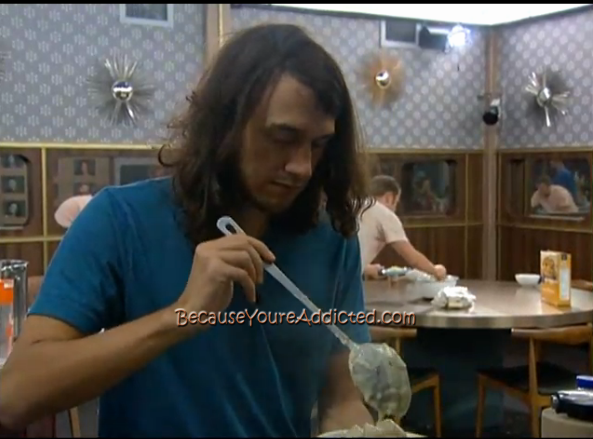 Andy: "Like, sorry Judd, but Elissa is more dangerous to me & Spencer." Spencer: "I don't think (Judd) would be mad because it's all moving forward with the Exterminators." Andy/Spencer are talking about a talk they had with Judd and how Judd wanted Elissa to stay over McCrae. Andy laughs it off. Spencer: "By the way, I wanted to congratulate you..."
Spencer: "If we survive this Thursday, we'll be the last power duo in the house." Andy: "Oh yea! So true!" Andy said that worse case scenario would be Elissa winning HOH, putting up McCrae and then McCrae wins veto..which would mean one of the Exterminators would go home. Andy: "...but the odds of that happening are so unlikely." Spencer: "Yea, well, you know what game you're playin'. Crazy sh*t can happen." Andy is scared that it'd be one of them (Andy/Spencer) to go up & out if Elissa won HOH and McCrae won veto, because GM & Judd are closer to Elissa. Other than that convo, there hasn't been any game talk, just a ton of non-stop Amanda bashing. At 6:15pm BBT, the HG's ate chicken dumpling soup that Elissa made for dinner. **And that's it for the Afternoon quickie post! Amanda commented that the Diary Room doesn't wanna see her "roll over and die" in the game, but truth be told, there's nothing that she could do to save herself. It's just a waiting game until Thursday. The only thing she could do, is try to go out with a bang before she leaves. @Alea73; thumbs up! Wow, way to ruin the moment, GM. She should have had to take Amanda's place on the block for that major flub! Seriously?! GM can't be that illiterate! Or could she? Here's to McCrae knocking everyone out & getting his 'fire' back!! Andy & McCrae & Narcissa aughtta team up. Get McCrae & Andy to the F2! GM, Spencer & Judd need to go. Okay okay, we know that GinaMarie is not very good with her words, but she's no moron in my book. She's practically the only one besides Helen, to not let Am/McC control her HoH. She saw how Aaryn was their puppeteer, & was NOT gonna let them run her HoH. I think she's smart other than trouble with her words. At least she is aware of her faults. She very openly admits that she doesn't say things correctly, that she is a poor speller. Never once have I heard her say that she was perfect. Despite her poor verbal abilities I think last nights episode shows she's got a lot more going on in her head than people give her credit for. No need for name calling. I think this BB cast has shown us all how nasty people can be. We don't need to continue it. There's basically a split right down the middle of The Exterminators as to who the next to go should be. Andy and Spencer think Elissa cause she'd target the 2 of them after McCrae. While Judd and GM think McCrae cause he'd target the 2 of them after Elissa. So really the next target for the Exterminators will depend on which half of the group wins HOH. However there's a little bit of an idiosyncrasy to it in that while one half would control the noms the other half would control the vote since HOH can't vote. Andy and Spencer have figured that out that they can't put up Elissa and McCrae if they win cause then Judd and GM would do what's best for them and vote out McCrae. So if they want Elissa to go they have to keep McCrae off the block. I wonder if Judd's figured out that same thing? I'd think he has otherwise if he put up Elissa with McCrae Andy and Spencer would do what's best for them and vote out Elissa. Andy and Spencer haven't really done a good enough job in hiding that fact with Judd that they think Elissa should go before McCrae. They should spend the next 3 days pounding it into Judd that they've seen the light and McCrae should definitely go 1st in hopes of getting Judd to feel safe putting up Elissa with McCrae so they can then vote out Elissa. @alea73: GM's nomination speech was painful to watch. When Judd (who btw is neck in neck with GM for the title of Least Articulate) has to help you out with your speech, you have a real problem. However, I don't think that GM's speech is reflective of her intelligence level. She may not be the best at expressing herself verbally, but her thought process through this game has been pretty spot-on for the most part. She has played her own game, she's a competitor, & she isn't afraid to take a stand and make bold moves. Had she not made offensive remarks towards every group on earth, she easily could have been a fan favorite. I think amanda is the worst house guest ever, how can she think that elissa is a bad person, shes the one thats a mean nasty bully and i cant wait till she finds out america hates her and shes an embarrassment to her family. No, I don't think GM is the brightest bulb. Do you think jury would vote for Judd to win after he was knocked out once? I wouldn't. I can't believe last night (on the feeds) when Elissa pulled Amanda into the cockpit room and told her that she wanted to vote to keep her in because she trusts her and mccrae more then others. Ok two things I have to vent on: The first is old. Aaryn, I am from Texas. Don't throw the whole state under the bus and claim "that's just how we talk down there". I am no choir boy, but I have never told an asian to go eat some rice. Second, Amanda gripes that others are moving forward with making "big moves". Last I checked, you need to win an HOH to really make a big move. Winning veto to take you or your bf down is not a big move. And voting in my book is not a big move. So she is leaving because she wins nothing. Her BB resume is lousy in my book. while on hold this morning at work, looked at tvguide site and it had the summer's winners and losers - it put Big Brother in the losers column due to the racist comments but it looks like viewership increased! The good news for CBS's reality staple is that its audience grew this year, averaging 7.2 million viewers (including seven days' DVR use). But the ratings growth was tainted by outrage over racist and homophobic comments made by contestants, which forced the network to run a disclaimer for the first time: "At times, houseguests may reveal prejudices and other beliefs that CBS does not condone." I find it funny how Elissa keeps saying how mean people are but continues to act in the same manor. Really to let GM say Amanda will probably commit suicide.???? Going a little far. This cast is THE WORSE / MEANEST ever. They are getting too personal.. its a game!!!! !